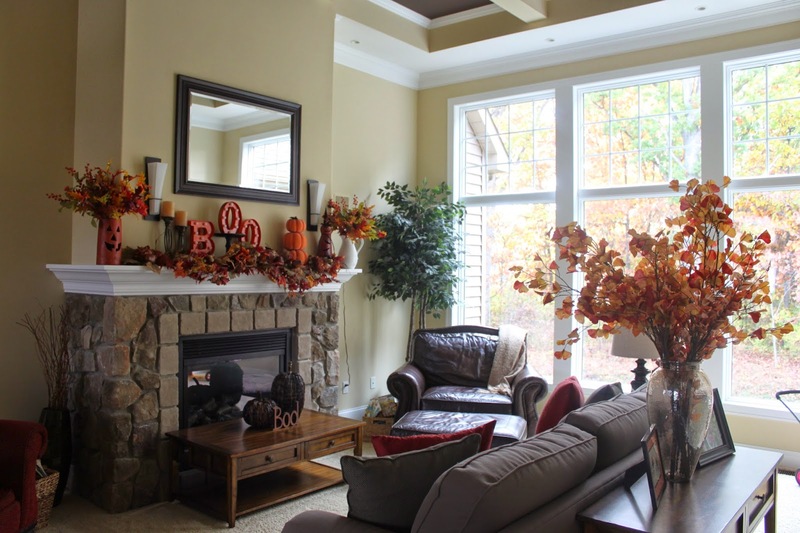 The challenge this year was incorporate all the fun and spooky Halloween decorations in with the classic fall leaves and pumpkins. 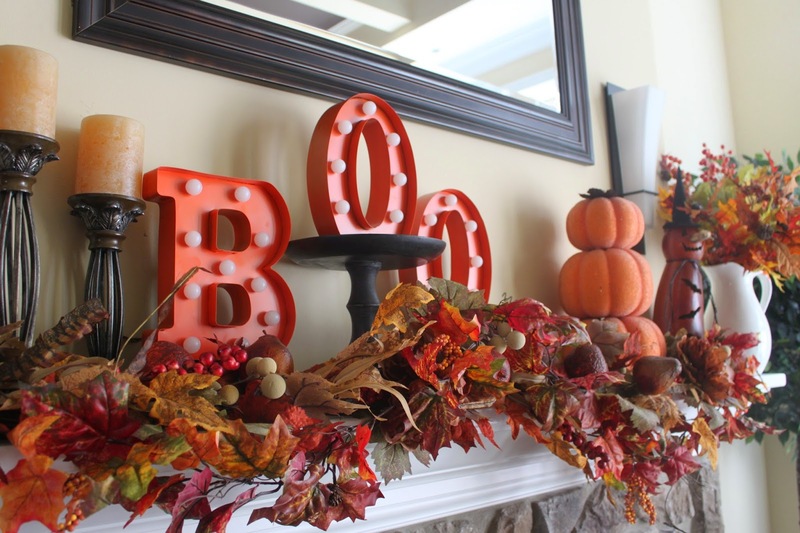 These marquee letters from Grandin Road are my favorite! And now for the fun stuff that makes my kiddos squeal with delight! This table and mirror is in the entry way. This is the first year I have put out anything bloody since my kids were born, but the older ones love it and the younger ones aren't bothered by it. 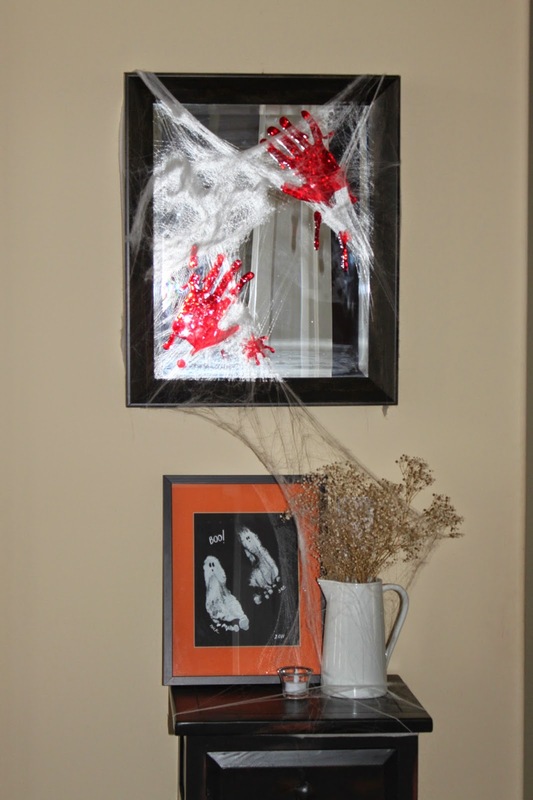 The ghost picture is my son's footprints that grandma made for me a few years ago. I also have one with my daughter's hand prints made to look like spiders. I picked him up at CVS! Of course his eyes glow and he talks! I made these eyeballs with styro foam balls and a black permanent marker. Easy and cute. Last but not least, our front porch. Mr. Bones and company want to thank you for stopping by and hope you enjoyed the tour. "Mrs.Party Planner" please check me out on facebook and "like" the page. New blog posts will appear in your news feed. The boys first trip to Disney World and it was right before Halloween! 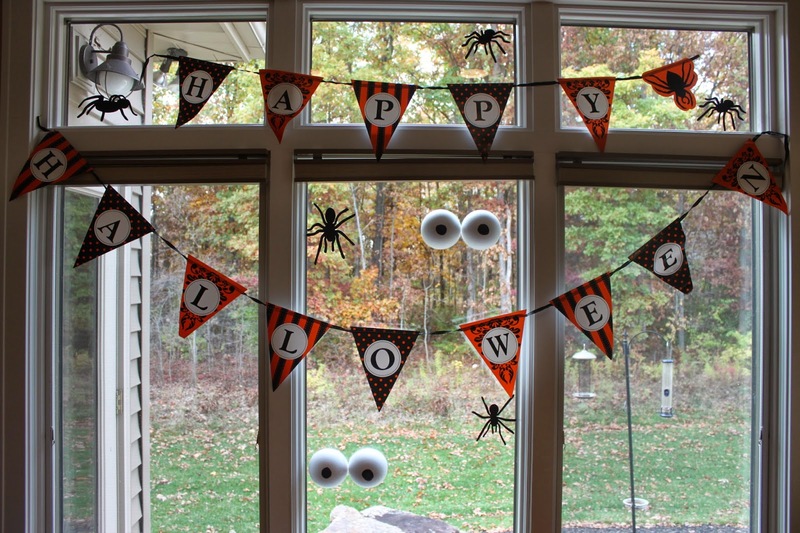 I still have lots of catching up to do on this blog and with Halloween just a few short days away I am determined to post all the Halloween happenings I have. 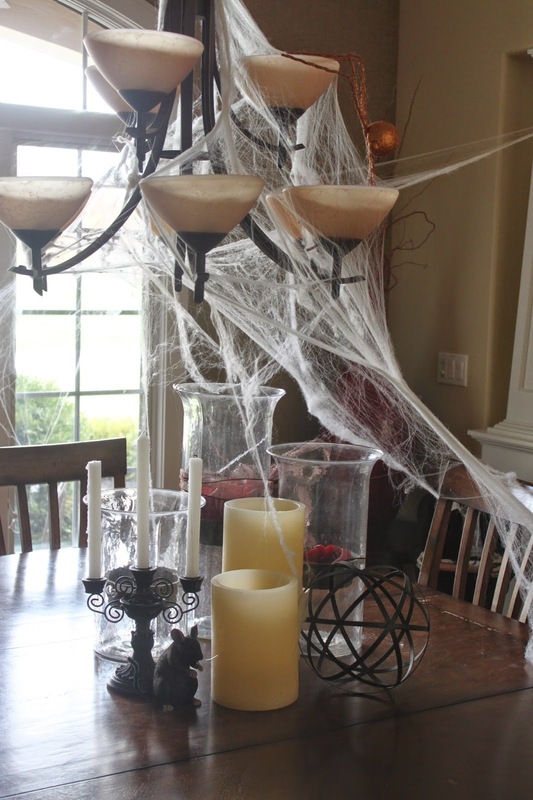 My previous post Happy Hauntings 2013 was all about the boys' Halloween party we had for friends and neighbors. 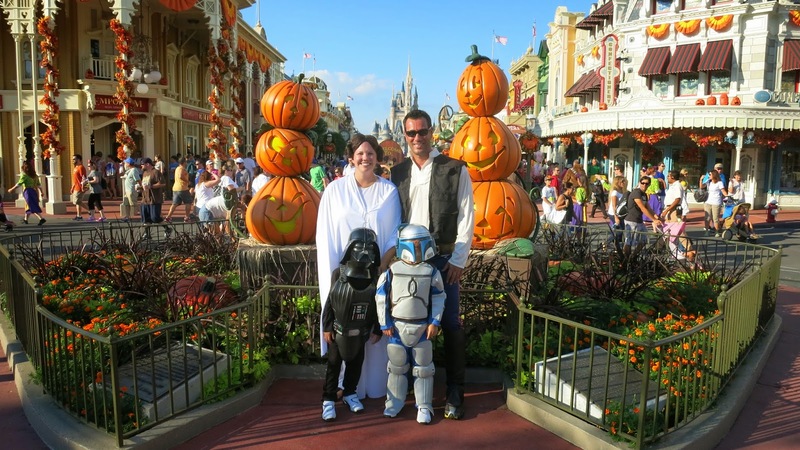 This post is all about what we did and do together as a family to celebrate Halloween. And for the record, taking a trip to Disney World does NOT happen every year :) Although, I would love to go back during the same time of year when the girls are old enough. 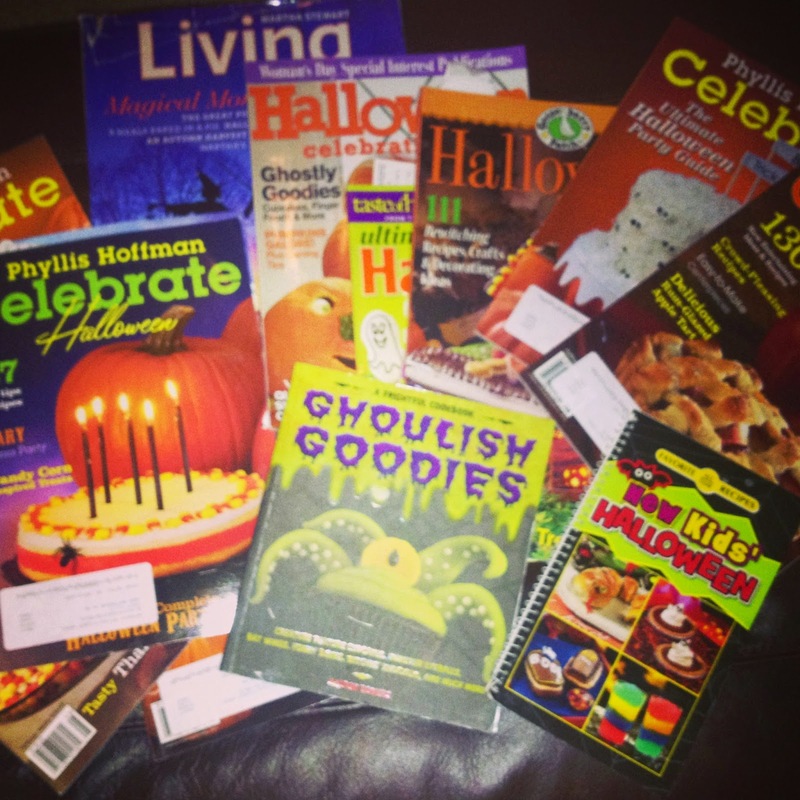 Some of my favorite books and magazines for Halloween inspiration and ideas! The month of October, quite possible my favorite month of the year is kicked off with a family trip to the pumpkin patch.This year was a lot of fun because the girls got to participate in all the fun! The boys leading the way through the corn maze. Visiting a local apple orchard to pick our own apples, making home made applesauce, reading Halloween themed books, attending zoo boo, decorating the house for Halloween, making a Halloween craft, hosting or attending a costume party, and having our own little family party before we trick or treat on the 31st are our favorite things to do every October! 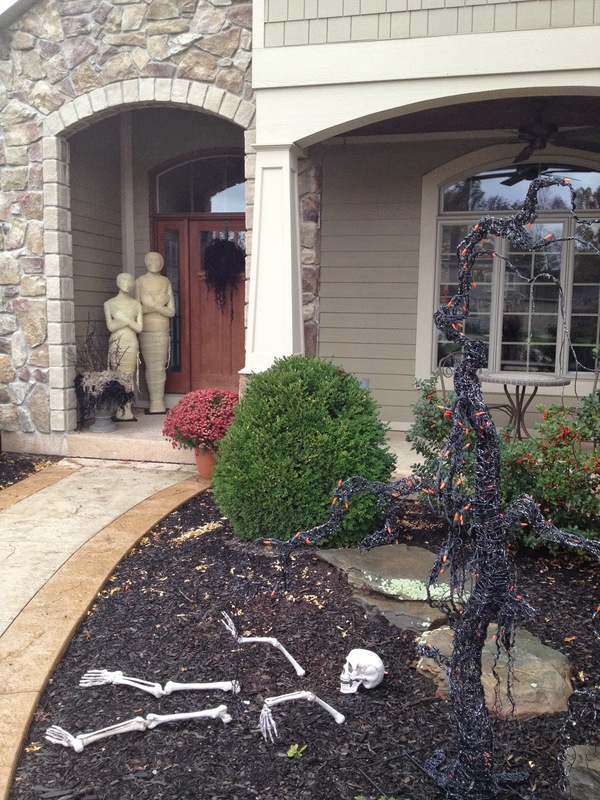 Our outside decorations last year. The boys like helping me decorate. 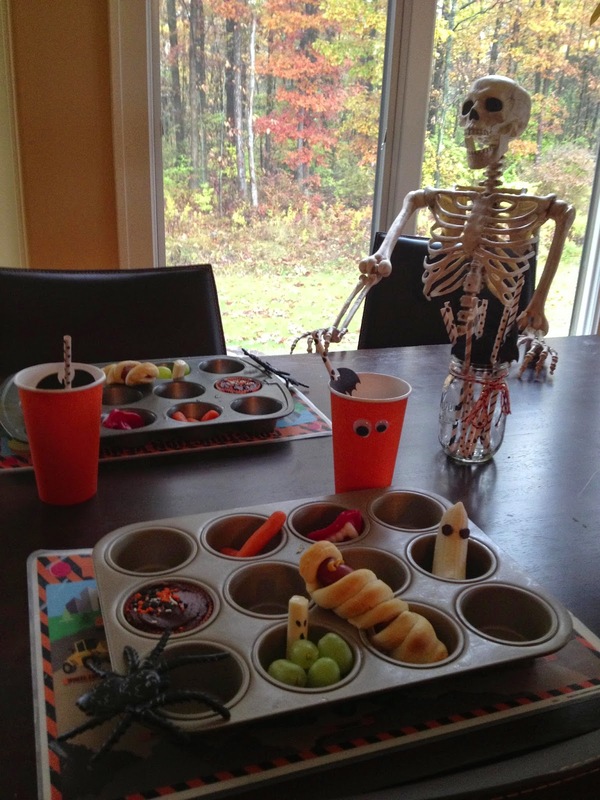 The last few years I have made a special Halloween lunch for the boys, this year the girls will get one too. Since the boys have been in school, I have everything all set up and waiting for their arrival home. 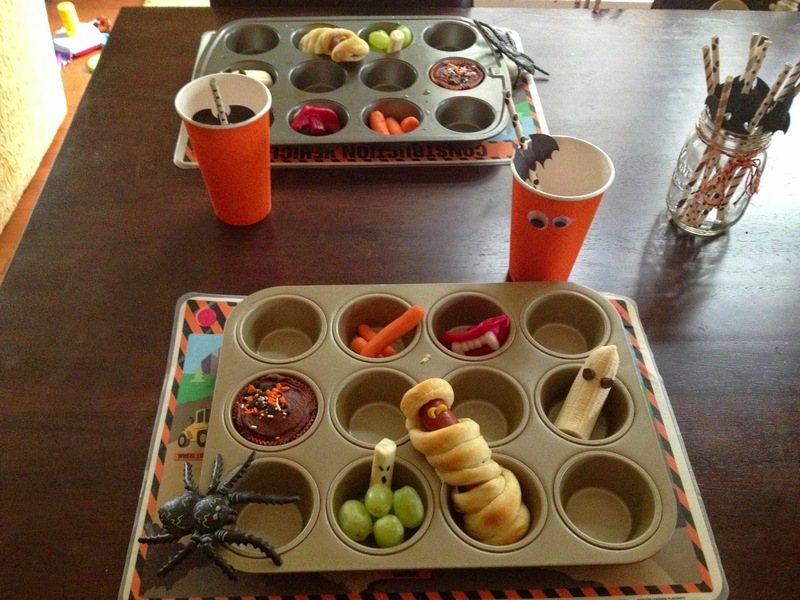 Fingers (carrots), mummy dogs, ghost bananas, eyeballs (grapes), and a sweet treat are our favorites. Although this year I may need to switch it up and try some new ideas. 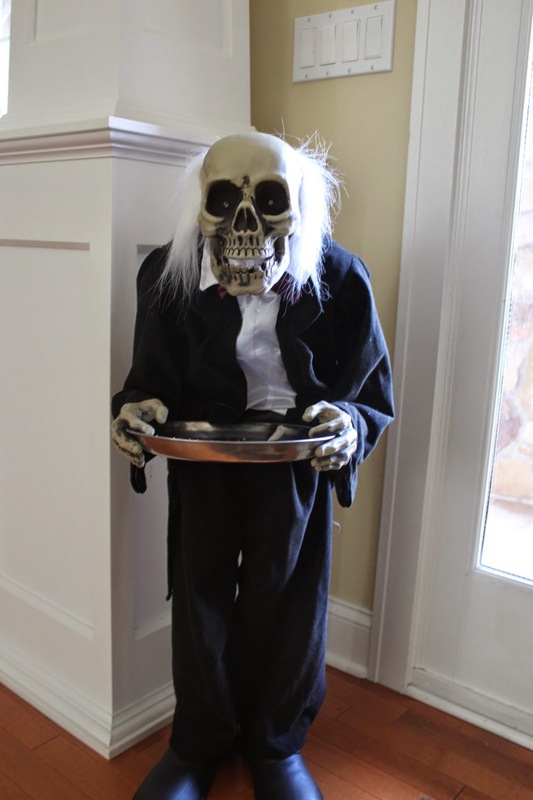 Mr. Bones was also awaiting their arrival! 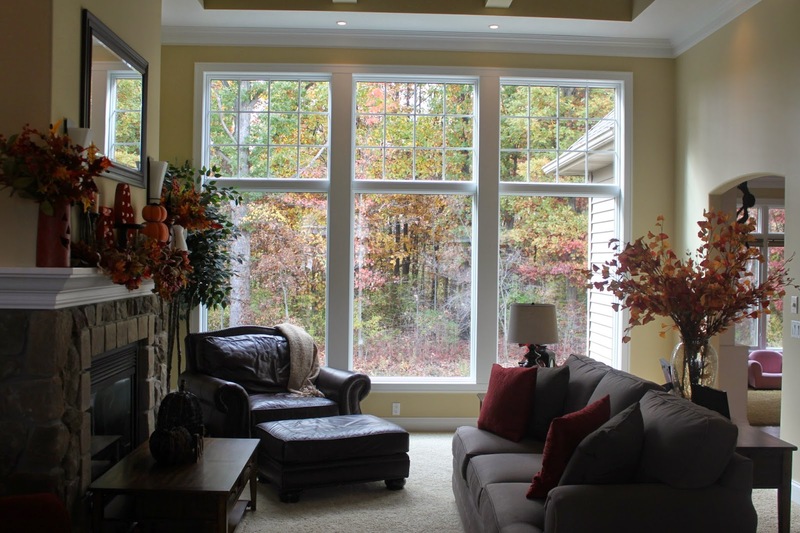 Last year, I purchased two 6ft. 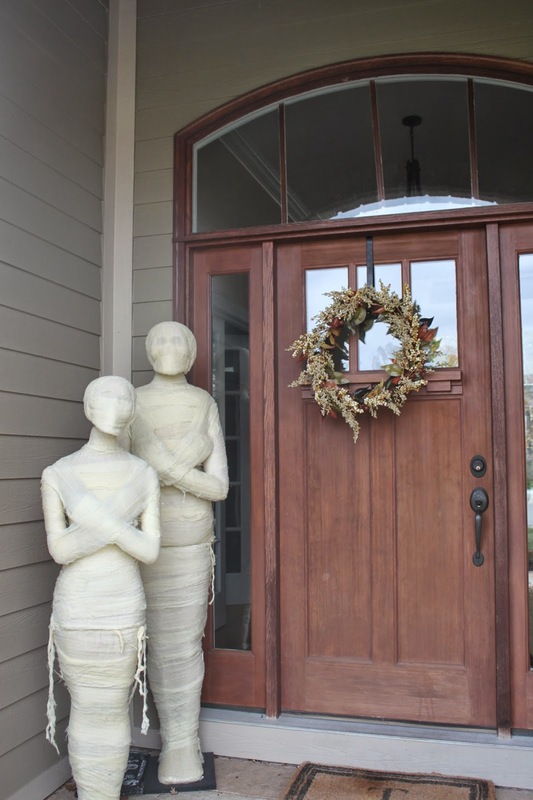 tall skeletons to add to our Halloween decorations, in this house we do double of everything! And being the festive and fun loving kids that they are, they fell in love and both appropriately named them Mr. Bones. Every few days I would place the skeletons in different locations for them to discover and howl with laughter when they found their Mr. Bones lying in their beds, sitting on the toilet, reading a book, or playing with their Legos! 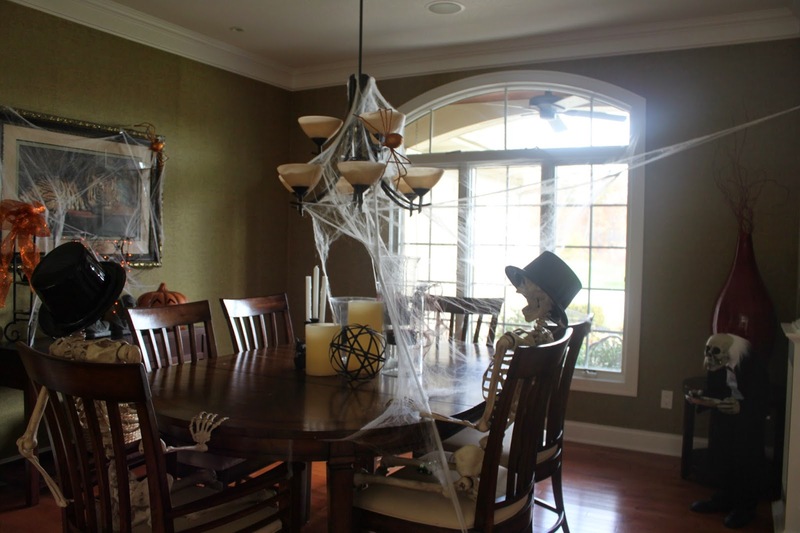 On Halloween, once Daddy arrives home from work, it's party time! We sit down to an early dinner, last year it was Monster Pasta. Otherwise known as pesto, noodles, mozzarella cheese, black olives, and red pepper slices I found on www.inspiralized.com. This was served with a side of fruit and vegetable before the enormous amount of candy is collected! 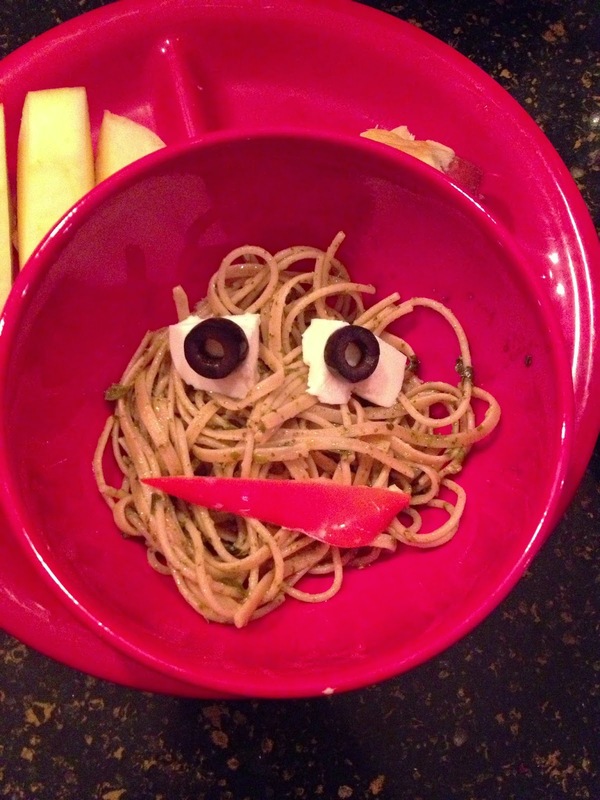 This year I have a new spooky spaghetti recipe to try. Look for that recipe in the weeks to come. Then we squeeze in a quick game of Halloween bingo that my mom made for us before it's time to trick or treat and end our month long celebration of all things fall and Halloween! 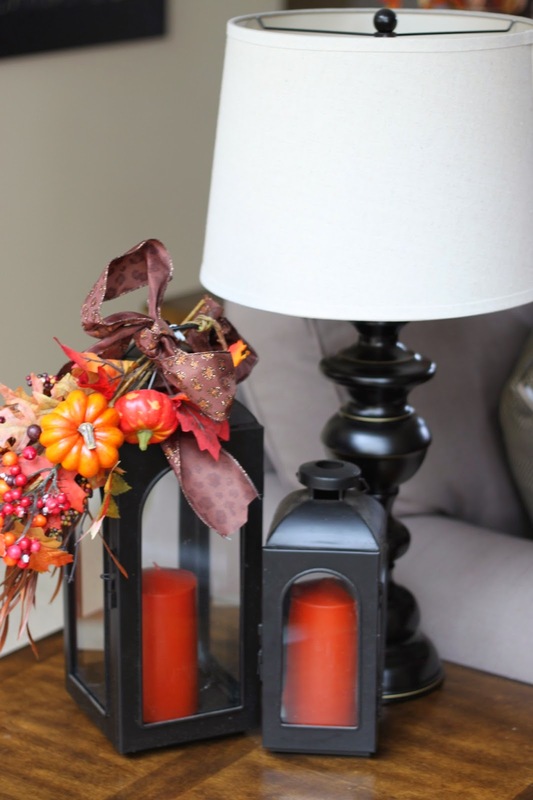 What kind of Fall/Halloween traditions does your family like to do? Please feel free to comment!